A detailed guide on using a free MP4 downloader to easily free download MP4 videos/movies/music videos in 1080p/720p HD, 4K/8K or 3D from YouTube, Facebook, Vimeo, Yahoo and 600+ sites. Wonder how to free download videos from YouTube in MP4 format for playback on iPhone XS/XS Max//8/7/6S (Plus)? This tutorial focuses on how to use the best free MP4 downloader for Windows (10) in market to easily get 8K/4K/HD MP4 videos/movies free downloaded from YouTube, Facebook, Vimeo, Dailymotion, Yahoo and other similar video sites, so as to have your favorite videos in your pocket with you and enjoy your favorite HD MP4 videos/movies anywhere and anytime. WinX YouTube Downloader - A free MP4 downloader enables you to free download MP4 videos in 8K/4K/1080p/720p, etc. WinX HD Video Converter Deluxe - Free download and convert any 8K/4K/HD videos/movies to MP4 and more at fast speed. Edit video. WinX YouTube Downloader, a 100% clean and free online video downloader makes free downloading MP4 videos/movies from online sites become so simple. With this best free (YouTube) MP4 downloader, you can easily download any YouTube video in MP4 format to your computer in a matter of seconds, be it 720p, 1080p HD, 4K UHD, 8K, 3D, VR movies. It also supports downloading MP4 videos/full movies for free from Facebook, Vimeo, Dailymotion, Yahoo and another 600+ online video sharing sites on Windows (10) or Mac. You can also use it to record YouTube live streams. Before free downloading MP4 videos/movies in 1080p/720p HD/4K/8K online, free download and install this top-notch free MP4 downloader WinX YouTube Downloader on your Windows (10) PC. Step 1. Click Add Url button to enter into the video downloading interface of this free MP4 video/movie downloader. Go to youtube.com or other 600+ online video sites to find the MP4 video/movie you'd like to free download. Step 2. Copy and paste the URL of the MP4 video/movie to the address bar. Click Analyze to analyze the MP4 video info. Choose MP4 format and select a resolution you want, like MP4 1080p HD. Then click Download Selected Videos. Step 3. Click Browse button to specify a destination folder to save the downloaded MP4 video/movie to your computer. Hit Download now to start the MP4 videos free download process. 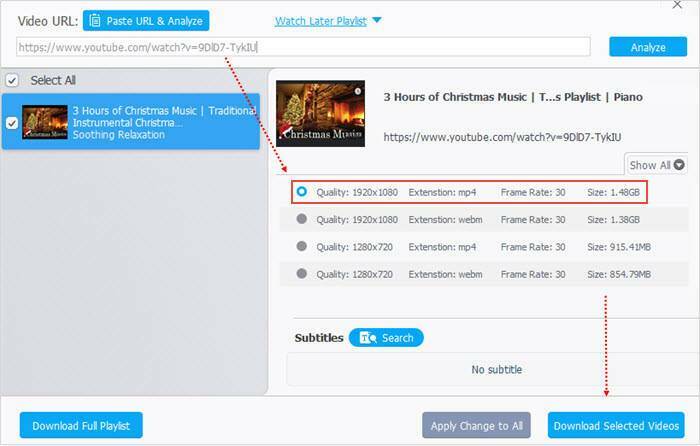 • Easily free download MP4 videos/full movies/music videos in 720p/1080p HD, 4K UHD/8K FUHD from YouTube, Facebook, Vimeo and 600+ video sites at 83x faster speed. • Convert any 8K/4K/HD/SD videos to MP4, AVI, WMV, MOV, FLV, M2TS; iPhone XS/XS Max/8/7/6S/6, iPad, Android Samsung S9; MP3, AAC, AC3, iPhone ringtone, etc. • Allows you to freely adjust the MP4 video parameters including bit rate, resolution, aspect ratio, sample rate, etc. • MP4 video batch downloading and converting. Cutting, cropping, merging, rotating, stabilizing, adding effect/subtitles to MP4 video are also accessible. • Convert music format. Convert DVD to MP4 and more. Record computer/iOS screen. Record webcam video. Support Nvidia/Intel/AMD hardware acceleration.